This page begins with a short essay to demonstrate art vocabulary. The rest of the page gives some explanations to clarify word meanings and show the differences between related words. Art is all about perception-- the way a person experiences reality-- and then about communicating that vision to others. Artists use various media to express their view of reality. A painter uses paint, a sculptor, clay or wood, stone or metal (designing in 3-dimensional space, using volume as well as the lines and color a painter uses), an architect designs buildings, an author uses words, a dancer uses movement, a composer writes music and a musician performs it. Each artistic medium (paint and canvas, clay or stone, words or music) has its own advantages and limitations. Each requires different technical skills, but they have many things in common. Most of all, they are means for expressing artists’ perspective or way of looking at life. Much art vocabulary can be divided into words related to perception and then words related to demonstration: seeing and showing. Many of the words are synonyms, but their shades of meaning provide different options to express as clearly as possible what an artist is doing. 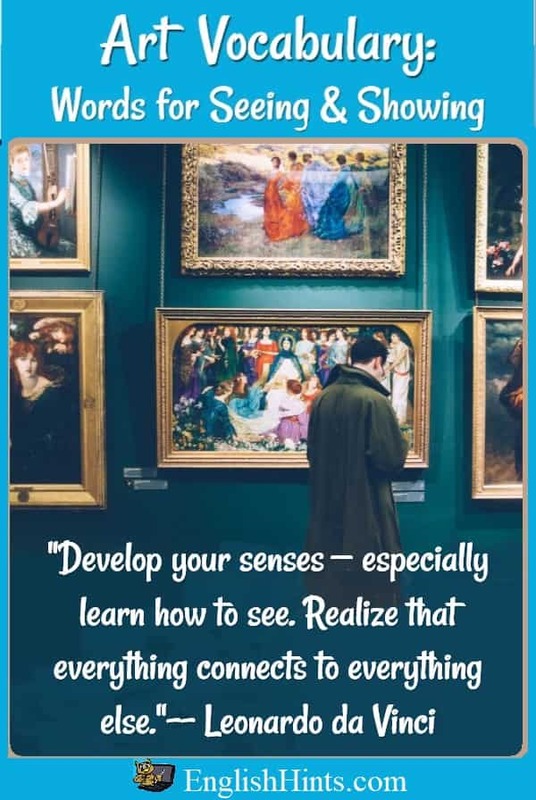 To perceive is to receive information from the senses: to see, hear, smell, taste, or feel something. Perception (a noun), thus describes the evidence of the senses, and something that is perceptible can be sensed. Aspects are different angles of something, or the way it appears when looked at from different directions. Perspective, from the same root as aspects, also involves how you look at things. It’s concerned with the position from which you see things-- your point of view. Artists use perspective to show distance, making distant people or buildings or trees smaller than ones that are close to the viewer. Vision, visual, and video all come from the Latin verb videre- to see. Visual’ is an adjective that means things that are seen. Visual arts are arts that can be seen. To visualize is to imagine-- to see a picture in the mind. Survey originally comes from that same root, via the French word for oversight. It can be a verb or a noun, with several different meanings: to take a broad overview of a subject (like a general “survey of literature” course in college), or to make a detailed examination. George Washington worked for a while as a surveyor: a technical job measuring and marking land boundaries to establish ownership. Now the most common meaning of a survey is a poll to learn how people feel about a subject by asking a random sample of people their opinions about it. To illustrate (from the Latin root for ‘light’) is to give a picture, example, or story to make your meaning clear. (It focuses light on the subject.) An illustration is a picture (most often), explanation, or example. Illustrators draw or paint pictures to illustrate books or magazines. To display or to exhibit is to present or show artwork, products, etc. (To put things where others can see them.) A display is an exhibit like that. An exhibition is a display of many similar products, works of arts, or performances. For example, a school might have a science fair exhibition, where students display their science projects. Each individual project would be called an exhibit. Equipment is the tools and other things needed for an activity. A painter’s equipment might include paint, brushes, and an easel; baseball equipment includes bat, ball, bases, gloves, etc. To equip is to provide the necessary tools or equipment. For example, a poorly equipped army does not have the weapons it needs. ‘Media’ (the plural of ‘medium’) has several meanings. It can be the materials artists use: their means of expression. It also refers to the ways to communicate information. If you read “the media,” it’s usually referring to various news-gathering organizations: reporters, newscasters, newspapers and magazines, radio and T.V. and online information sources. ‘Medium’ can refer to one means of expression (as above.) More often it means ‘in the middle’-- a medium-sized shirt is between a little and a big one; a medium-rare steak is between raw and ‘well-done’ (fully cooked). Artists often use symbols to express their ideas. A symbol is a way to represent an abstract or complicated idea without a long explanation. For example, flags are symbols of their countries; the sun can symbolize light and a knife might symbolize violence. Sometimes artists will use familiar symbols in uncommon ways to change their audience's perspective or make them think more deeply about their assumptions-- common ideas accepted without much thought or examination. To transform is to completely change the form of something. The Internet has transformed (or caused a transformation in) the way we find and share information. Artists are often unconventional. ‘Convention’ has two meanings-- a usual way of doing things, or a big gathering (from the Latin for ‘come together.’) People who act conventionally act like most people in their society. They do what others would expect. Artists tend to dress, act, and express themselves unconventionally-- differently than most people. They are concerned with expressing their individual visions of reality.